An amusing and well-told satiric tale taking place in 1970. The story involves a Pacific island republic that is freed from British colonial rule only to find itself an unwitting pawn in international affairs. The options of the major powers (US and UK) are constrained by that damnable new force, "world opinion." In an inspired turn, Wibberley has the US vice president make a "private" unnannounced trip to the island, only to be eaten by headhunters. Wibberley has a dark sense of humor. This is a fun quick summer read. Wibberley is eerily prescient about the forces shaping modern politics and international relations. Lots of fun. I have to confess i didn't buy this book. Someone left it on the table in canteen, i have read it right there for around 20 pages then there's a woman was staring at me that i realized this book might be hers. I returned it and went straight to the library. So lucky i found the book. The story reminds me of Don Quixote USA of Richard Powell. It's hilarious and charming. Politics irony, This kind of story is my type. If you love Don Quixote USA, you will love this book. Noted in my 1966 diary but no comments beyond 2.5 stars. 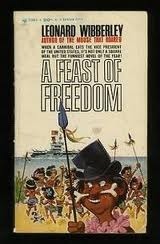 Amusing bit of political satire, but not as fun or filled with as likable characters as the 'Mouse that Roared' series.